This post first appeared on Edudemic. Social media pervades all aspects of modern society, particularly with the rapid influx of mobile devices. If used in meaningful and appropriate ways, it can transform a student’s learning experience, improve communication with parents and community members, as well as support professional growth. However, teachers and administrators also confront the realities of opening up students to a global audience, and address real concerns about security, screentime, inappropriate behavior, and acceptable use. While the first instinct in schools and districts is often to block services such as Facebook, Twitter, Pinterest, and even some blogging platforms, the positives of these tools often outweigh the negatives. When used well, social media tools connect all stakeholders in a school community in a ways that have never before been possible. In the past, the only real way to get a good grasp on what was happening on a daily basis was to physically spend time in the building – which, of course, is not a possibility unless you are a student or employee in the school. But now, if the educators in a school are savvy about sharing what is happening, amazing connections can be made by those both inside and outside of the learning community. In Burlington, MA the use of Twitter and other social media resources has allowed a 1:1 iPad initiative to expand faster than ever expected thanks to the connections staff and students have made with learners in other 1:1 communities. The ability to ask questions of others who had prior experience integrating 1:1 technology into their classrooms allowed the learning curve to be less drastic. In addition, connecting to this network of other learners from all over the world who are passionate about the integration of technology into learning environments has allowed for the ongoing sharing of best practices in an ever-changing environment. Another positive outcome of the adoption of social media tools in Burlington has been the increased communication and transparency about what happens across the district. People within the school community, and others who have an interest in following the happenings, can see stories and pictures on a daily basis. District blogs like the Burlington Public Schools Blog, and school-based blogs like the Pine Glen Principal’s Blog, give a daily glimpse into the engaging learning activities that are happening. The district also shares information on its Facebook, Twitter, and Instagram accounts. The ease of access to information has allowed the district to manage a few emergency situations with much less parent and student anxiety due to the fact that stakeholders were able to have questions answered and situations clarified easily. In addition to publishing through specific school owned channels, through tagging, schools can expand the reach of their communication. From “The Voice” using hashtags to save contestants, to Jimmy Fallon’s hashtag parodies, the idea of curating ideas through tags that span social media has also expanded to schools and classrooms. Not only do hashtags categorize content, but they also allow schools, classrooms, and districts to curate communications from across social media – even if all stakeholders do not have a social media account. At PS10 in Brooklyn, NY, Chris Casal (@mr_casal) has created a number of hashtags to help connect his students and school to the broader community. #ps10st – denotes that all tweets or posts were written, with supervision, by students from a teacher or school account. This system allows teachers and students to contribute from any social media account and any tool. Rather than needing to follow a specific teacher, class, school, or student accounts, parents and the broader community can see the happenings of the school by following the hashtag. In a similar vein, and to encourage more teachers to engage in social media, Jill Gough (@jgough) at Trinity School in Atlanta encourages her faculty to use #TrinityLearns. Not only does this hashtag allow teachers to connect and share what they are learning as part of their own personal professional development, but it also showcases what the students are discovering in their classrooms. By encouraging teachers and students to contribute to a global conversation, they are leveraging social media to showcase the positives and connect students to an authentic audience. Consider the tone that a community hashtag can set. At Trinity, think about the connotation of teachers and students using #TrinityLearns. Michael Podraza (@EGHSPrincipalRI), principal at East Greenwich High School in RI started #EGHSmatters. He wanted his school community to understand that special people make a difference every day. Students and teachers can show gratitude, congratulate, and promote members of the community by tagging posts – simultaneously bolstering their peers as well as promoting their school. When students are empowered to share their learning, to take social responsibility, and to connect with a broader audience, they take great pride in their work. As Karen Lirenman (@KLirenman) says, “If using social media such as twitter and blogging was a great way for me to learn, wasn’t it only fair for my students to have that opportunity too?” Her first graders blog, tweet, and connect through a variety of social media, extending the classroom well beyond the walls of the building. “What if you gave a student in your school access to the district Twitter account?” asks Craig Badura (@mrbadura). 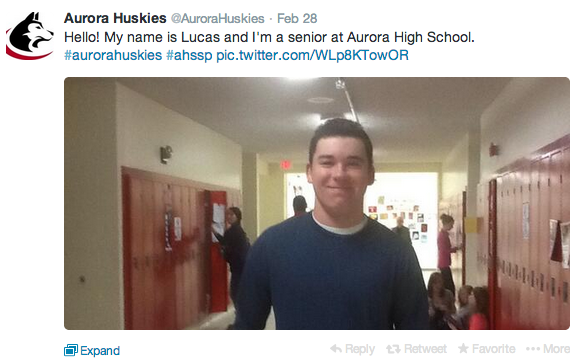 Inspired by Lincoln Public Schools (@LPSorg) in Nebraska, he decided to hand over his school @AuroraHuskies account to student tweeters. With all of the great things happening in our schools, imagine the power of allowing students to tell the world all about them. Patrick and Beth will both be speaking about this topic, and others at the upcoming EdTechTeacher Learning Futures Summit in July. EdTechTeacher will also be offering Summer Workshops focused on Digital Citizenship and Social Media.